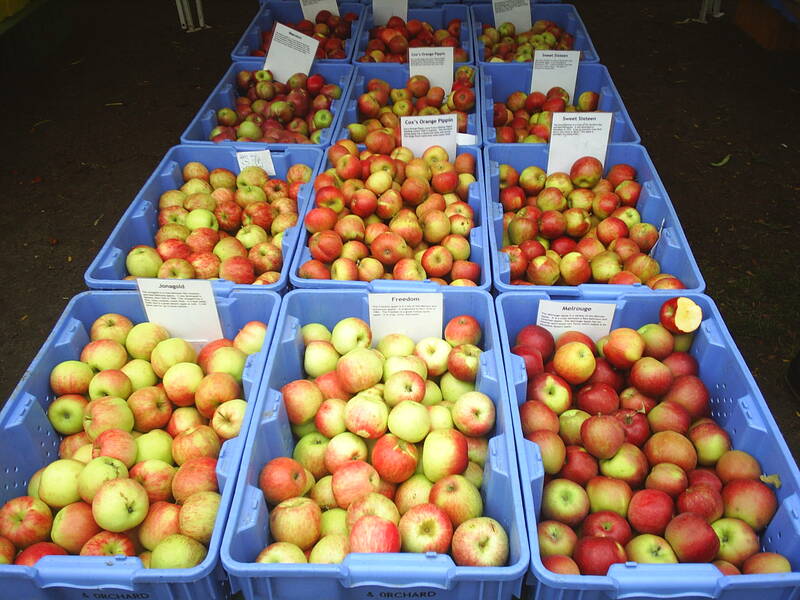 Red Delicious, Macoun, Northern Spy, Winesap, Swiss Gourmet, Braeburn, Gala, Mutsu, Sweet Sixteen, Liberty, whoa, stop me here. If I continue to list the approximately 7500 known varieties of apples in the world, I would far exceed my roughly 500 word 0r less (ok, don’t go counting each entry word-for-word now) per blog entry limit. And, if I attempted to sample each variety? Well, let’s just say I would be eating an apple a day for the next twenty years. Hey, one way to keep the ‘doctor away’. Now I know you can probably get your hands on a few of varieties of apples at the grocery store year round but before you go and settle, get yourself out to the Farmers Market (I know that there are a number still running outdoors thru the end of October and a few into November) and treat yourself to some Illinois, Michigan and Indiana apples the way they were meant to be enjoyed. Fresh from the farm and free from wax & shellac coatings and nasty irradiants & preservatives (yeah, this explains why that store-bought apple you cut into and forgot on the counter, still hasn’t turned brown after a couple of hours) and full of flavor. Yes flavor. Most commercially grown apples have had the flavor bred right out of them, producing a good looking, but bland and (as termed by the commercial growers not me) ‘neutral’ flavored piece of fruit. 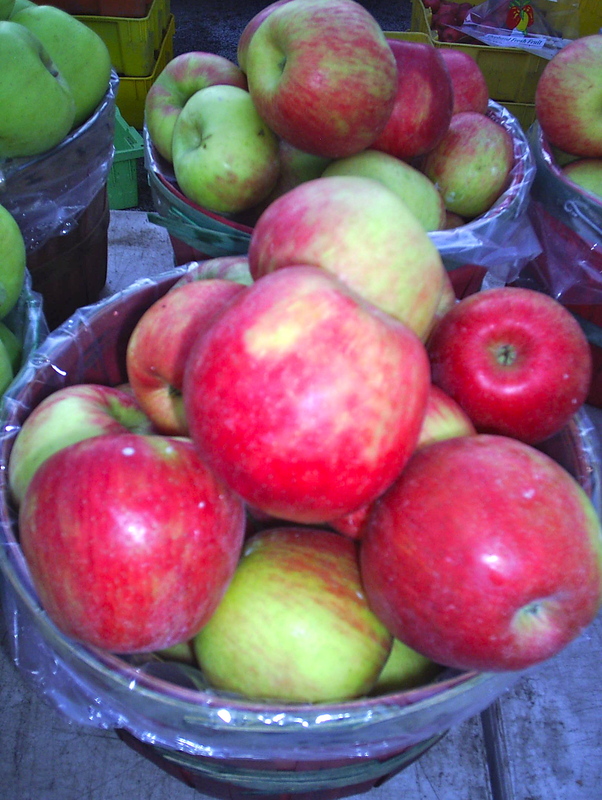 Go get to the market and discover what apples should taste like. And those flavors are as diverse as the names. Oh, and looks ain’t everything either. Take the ‘Twenty Ouncer’ for instance — a huge variety that has a rather russeted and bumpy (like, no other way to say it, bad acned) surface. Bite into it and you will never judge an apple by the surface again. Besides the Orange Cox Pippin and the Honey Crisp, I think the Twenty Ouncer is one of my favorites this season. But don’t go on my tastebuds alone, plenty of the Farmers Market vendors are more than happy to have you sample varieties you are unfamiliar with. And they are more than happy to explain the nuances of each variety. Why, Nichols Farm alone grows about 167 plus varieties of apples. Look for fragrant, firm and tight skinned apples. Bruising, bad. Russeting (patches and stripes of different colors), good. Lots of fiber, lots of flavonoids, lots of antioxidants, lots of tannins, and low in calories, no wonder we should be eating them ‘once a day’. Enjoy as is, slice into salad, or slip into a grilled cheese sandwich. Cook down into sauce (just cored, peeled and sliced apples, a squeeze of lemon, a little water, cinnamon if you like and that’s it, just some time on the stove), bake into a pie or crisp, add to soup, roast or grill to accompany pork and chicken, or as below on a perfect salad for this time of year. rosemary (fresh of dried), about a tsp. Preheat over to 400 degrees. Cut apples in half, and core. Place flesh-side up in a baking dish. Drizzle olive oil and sprinkle salt, pepper and rosemary on the apples. Roast apples for 20 minutes. Remove from oven. 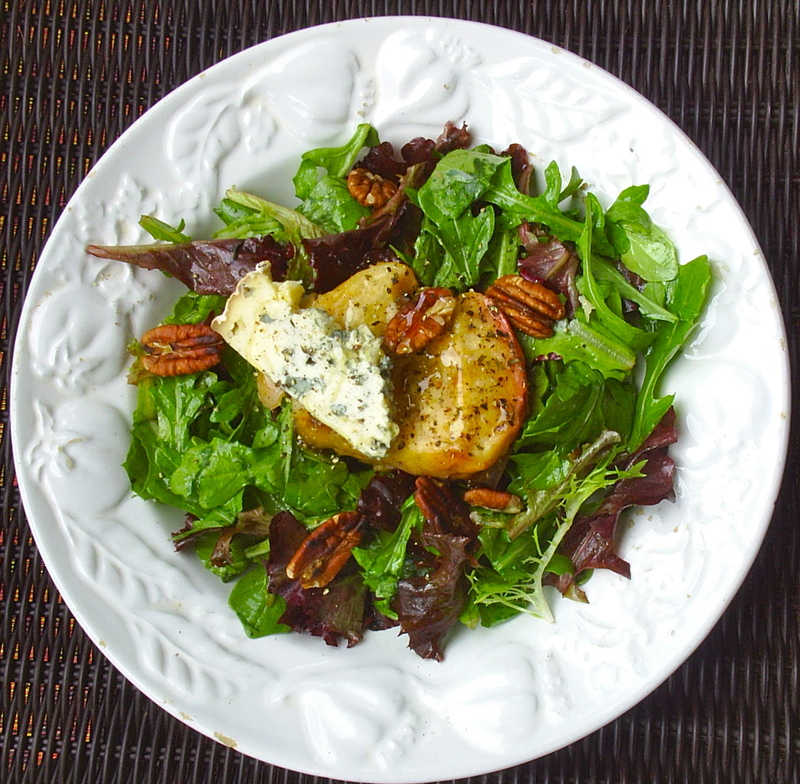 Toss salad greens with vinaigrette and divide among 4 salad plates. Place one apple half on each plate of greens. Then top each with a slice of stilton and a drizzle of honey. Kick it up a bit more with a sprinkling of toasted walnuts or pecans. This entry was posted in To Market with Mo and tagged Andersonville Farmers Market, apples, Chicago Area farmers marekts, Chicago Farmer's Markets, Evanston Farmer's Market, Farmers Markets, fresh organic, fresh seasonal organic produce, Glenwood Sunday Market, Green City Market, moira's blog, Nichols Farm, sustainable, to market with mo. Bookmark the permalink.